This fall I'm obsessing over kale. It began when I tasted a shredded raw kale salad made right out in the garden last spring. It was simply dressed with lemon, tamari, and sesame seeds. Strawberries added a bright garnish and flavor. It made an impression on me, so when fall approached I planned to test a few different varieties, and sowed some flats for seedlings. 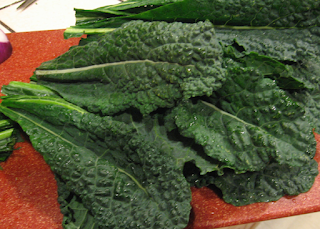 Kale is a cool weather crop that can be grown fall through spring in the temperate San Francisco Bay Area. It tolerates frost, as does lettuce, broccoli, cabbage and Swiss chard. Plant these in the early fall to enjoy over the winter. 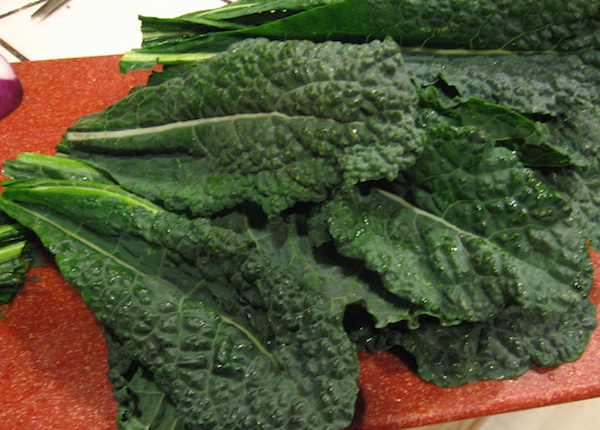 Cold weather and frost are said to contribute to better flavor and texture for kale. At the Chez TJ kitchen potager, I harvested our first Lacinato Rainbow kale crop for the kitchen a few days ago. The seedlings were planted in September and they grew quickly. This pretty kale has beautiful purple-pink stems and tender frilly leaves; it's a handsome plant for the winter garden. I discovered that it is a hybrid made by Frank Morton who crossed Tuscan kale, (also known as Lacinato or Dinosaur kale) with Redbor kale. It looks very much like Red Russian kale. This caused some confusion, as at first I thought it had been mislabeled! 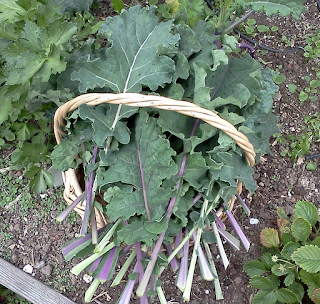 This weekend I added Tuscan kale to the garden (Dinosaur kale) that I grew from seeds at home. 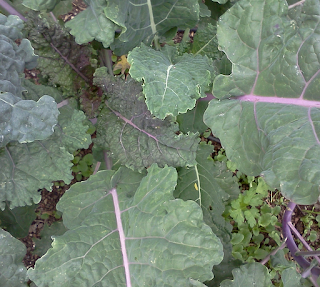 Tuscan kale has evenly dark green, elongated leaves that have a pebbly suface. It's tender and flavorful - a popular item at my farmer's market. 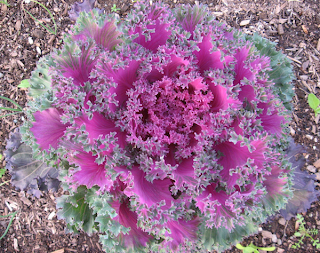 The beautiful purple, pink, and gray-green ornamental kale above is planted in my front yard bed among lettuce, onions and Red Russian kale - it makes a striking centerpiece. 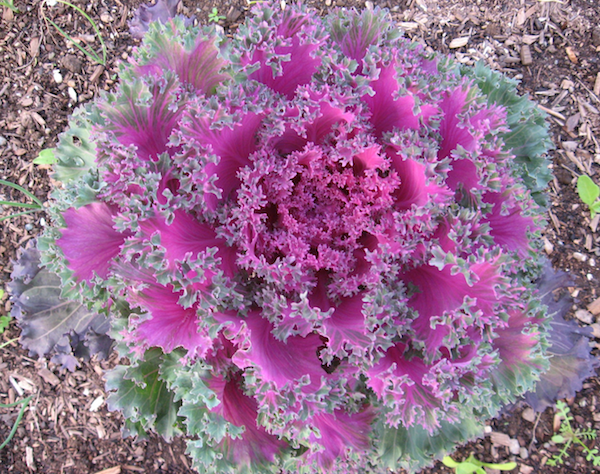 Ornamental kale is edible, but don't eat it if it wasn't grown organically, as it may have been sprayed with pesticides and cultivated with synthetic fertilizers. 1. Thinly slice a bunch of kale (that has been rinsed in water first) crosswise, leaving the stems for the compost pile. 2. Saute a clove of chopped garlic for a few minutes in the olive oil, then add the sliced kale. Toss it gently while cooking to make sure it cooks evenly. Taste after a few minutes to test if it's done enough to your liking. 3. Season with a sprinkle of kosher salt, and add a few drops of lemon or balsamic vinegar before serving, if desired. 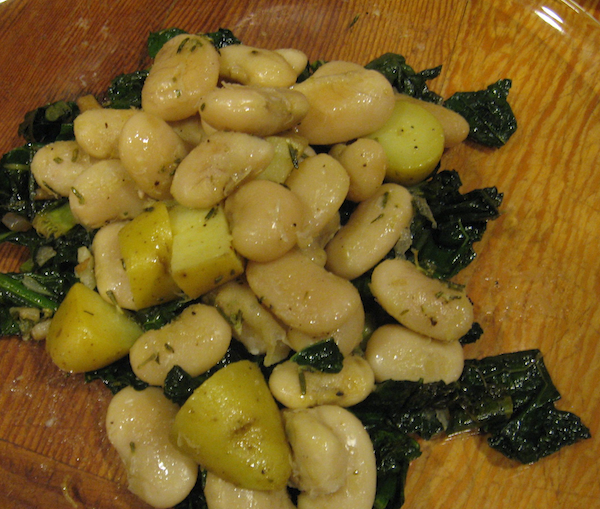 You can also toss the sauteed kale with cooked pasta or rice and sprinkle with toasted sesame seeds. This dish is good cold or warm, and thinly sliced red sweet pepper is a nice addition for color and bright fresh flavor. Or serve tender white beans on a bed of sauteed kale (below). Pruning your berry bushes can seem like a daunting task, but it doesn't have to be complicated. 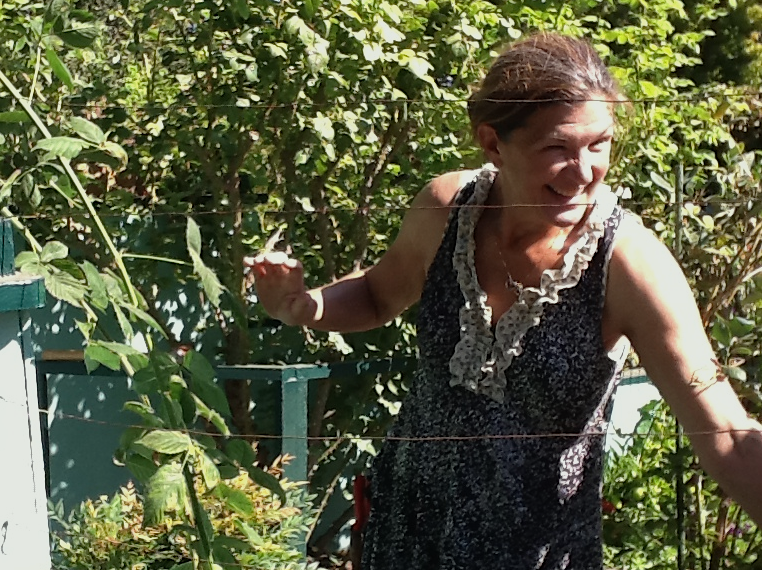 That's what I learned recently when I joined experienced horticulturalist Debbie Stern, head gardener for Rosiland Creasy, to lend a helping hand, but mostly to learn. Since most berries are vigorous growers and will happily spread wherever they are planted, the ideal is to keep them under control from the beginning. 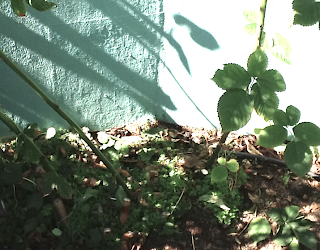 I've been hesitant to plant any because of the potential for a berry take-over of my garden. But I got over my berry fear by learning hands-on how it's done. 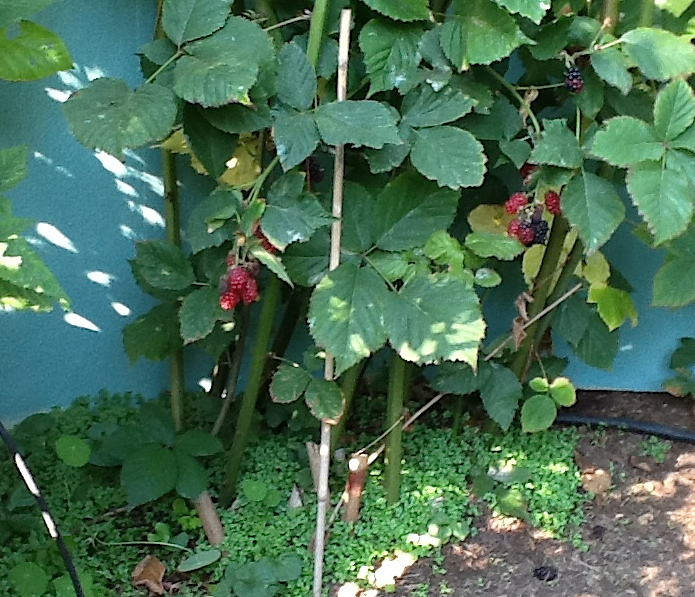 In general, cane fruits (also known as bramble berries) such as blackberries, raspberries and hybrid berries, are pruned by cutting the canes down to the ground after they have finished fruiting. New fruit is produced from new canes, so you must be careful to identify which canes haven't fruited, and save those for next year's crop of berries. 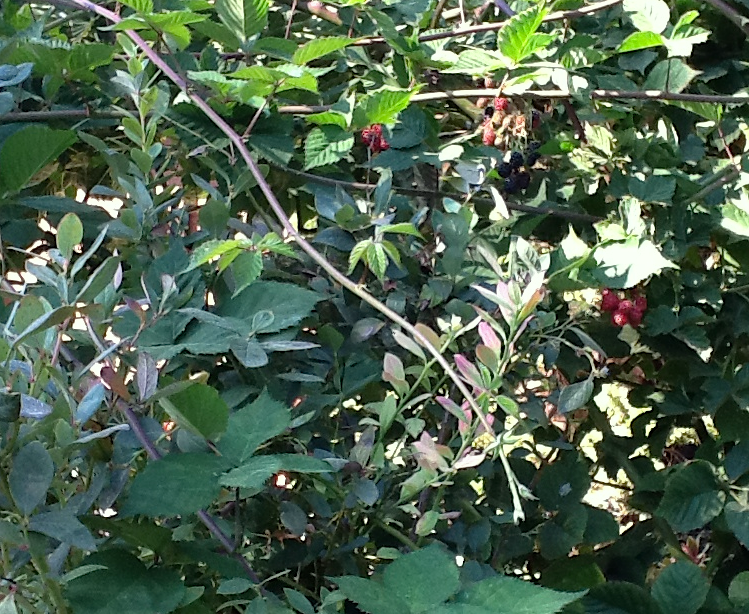 If you wait to prune in late fall or in winter, you'll be sure to get the all of berries for the season. Exception: for "everbearing"raspberries that fruit in summer and fall, then again the next spring, you only prune the top of the canes that have fruited, because those canes will be the spring fruting canes. Refer to: Edible Landscaping, Rosiland Creasy, 2010. If you can, take advantage of the thornless cultivars of blackberries, such as Black Satin, Arapahoe, Apache and Navaho. Black Stain is the variety in these photos, and a favorite of Rosiland Creasy. You might recognize the colorful wall below from photos in Creasy's excellent book on edible landscaping. 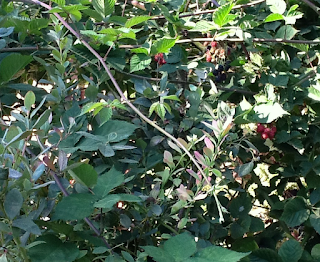 The are kept well under control in her front yard (below) by yearly pruning and produce lots of luscious berries. 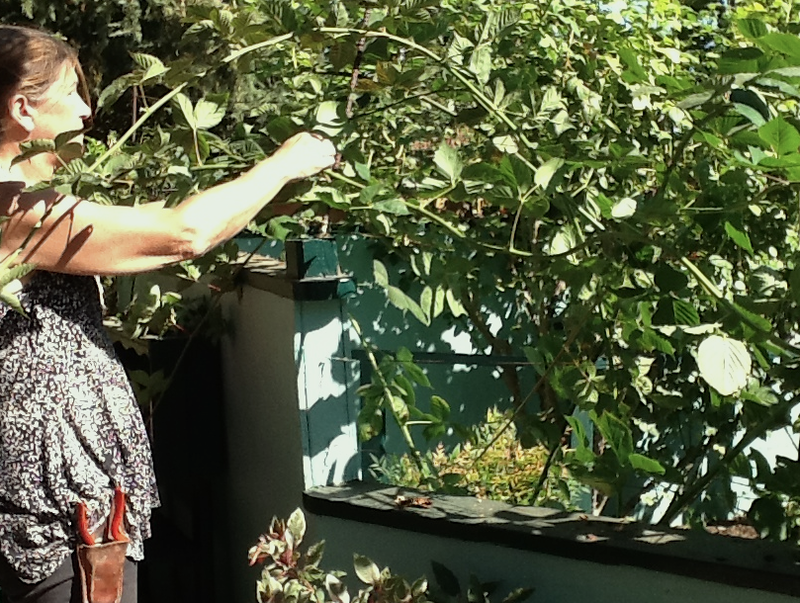 By pruning the canes every year and digging out any suckering canes, and uprooting any that have rooted when they touch the ground, the berries can be prevented from unwanted spreading. 1. Find the fruited canes by looking for signs of fruiting (you'll see where the berries were attached and have been harvested, or find old berries the weren't harvested) and cut the cane by several feet. 2. Find each cane that you cut and trace it back down to the ground; cut it off at the ground. Do this for all of the fruited canes. Be careful not to damage tender non-fruited canes, as they're usually all tangled together. 3. You should now have only canes that have new growth and no sign of fruiting; they are usually very green and supple. Choose three healthy canes to leave for next year's berry crop. Pick canes that are not too thin, but not too old and thick either so that they will develop vigorously. 4. Cut down to the ground and remove all non-fruited canes except the three that you picked. Tie these onto your trellis using twine in a figure-eight loop to create a little space between the trellis and the cane. Done! From just three canes you will get lush growth. You may be tempted to leave more, but it may lead to more work than you planned for next fall to untangle and prune your berries. 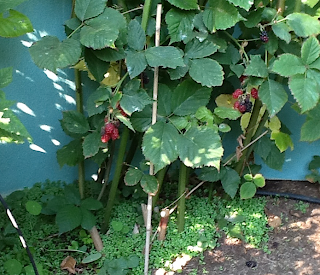 Experiment and see how your particular berries grow. Tie the three remaining canes to the trellis - done! Edible Landscaping, Rosiland Creasy, rev. ed. 2010. Pruning and Training, Christopher Brickle and David Joyce, the American Horticultural Society, rev. ed. 2011.